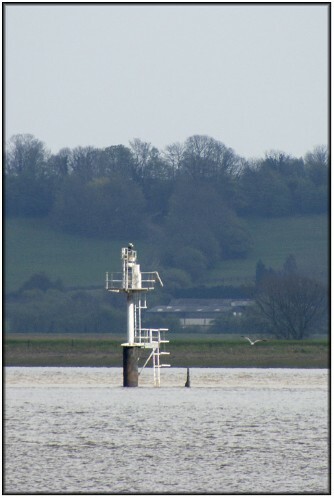 This has got to be one of the more obscure lights in England and also, considering the fact that it is in an inland location and not perched on some isolated rock out in the Atlantic, one of the most inaccessible. There is no reasonable way of getting close to the light on foot and the best that can be done is to photograph it either from the water or from a rather distant viewpoint on the north bank of the Ouse or an even more distant one on the east bank of the Trent. Data are also singularly hard to come by and I have drawn a total blank with my usual sources. The current light is of the "bulb on a post" type and all that I know about its characteristics is that it is a flashing green light. Even it's location is hard to describe. In physical terms it is situated at the apex of the training walls that mark the confluence of the Rivers Ouse and Trent, and administratively, despite being on the opposite side of the Trent, it is technically within the North Lincolnshire parish of Alkborough. In the photo above the Ouse is in the foreground, and the Trent in the background. This photo was taken from the riverbank close to Faxfleet where there is some limited public parking. The light along this stretch of river is likely to be extremely unfriendly to photographers for most of the day and to make the best of what is likely to be a bad job a visit either early in the morning or late in the afternoon would be advisable. Alternatively, you might want to consider an overcast day such as the one I had when the above photo was taken. 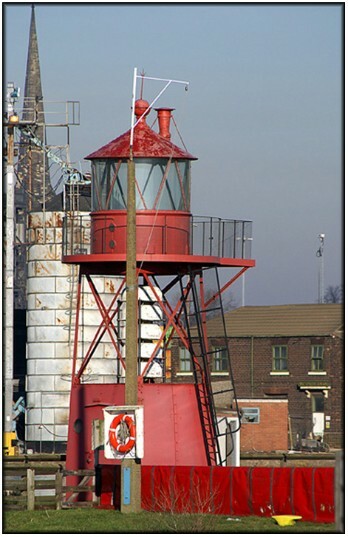 The image below shows the original Apex Light which is now preserved in Goole Docks under the auspices of the Waterways Museum. This was a much more substantial, and more conventional looking, structure. The skeletal tower seen in the photograph was originally supported on a frameworking of timber baulks. Dates are hard to come by, but this light was certainly still in service as late as 1974.